At the 2014 Geneva Motor Show, Audi unveiled its all new sports car badges as, Audi TTS Coupe 2015. This innovative new model features innovative virtual cockpit, has a light-weight body and through power beneath the hood can thunderously sprint in less than five seconds. Rounding up everything, it’s a perfect amalgamation of, looks, features and performance. As far as luxury is concerned, it comes from the house of Audi. Let us hit the cursor down and have a closer look at the specifications and details of the model. Interior of Audi TTS Coupe 2015 is clean and futuristic. Horizontal lines and surfaces can be noticed combining the door panels and center tunnel console while MMI screen located in center and instrument panel forms the digital unit for model; as mentioned ‘virtual cockpit’. When you look from top you’ll find instrument panel holding resemblance with an aircraft, with turbine like designed round air vents portraying looks of jet engines. Mounted in front of them are highly comfortable and lightweight specially developed S sport seats sitting upon which driver can hold the multifunction steering wheel. In all the entire interior of Audi TTS Coupe from our perspective landed to be a designer, futuristic and comfortable creation for those looking for a dad-to-day ride. 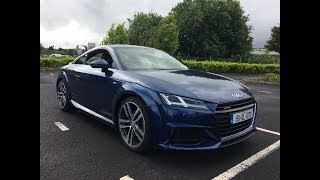 Exterior of Audi TTS Coupe 2015 is iconic and dominating with front fascia marking presence through its wide singleframe grille with a muscular line dividing it in two. At both the ends of the grill are located Matrix LED headlights with integrated indicators that work upon the steering wheel’s movement. Moving towards the rear of Audi TTS Coupe 2015 holds same taillights and indicators as located in front. Beneath the rear spoiler is located a very thin third brake light strip, which undoubtedly adds to the looks of model. Beneath are positioned two large exhausts in round shape adding a bit of aggression. 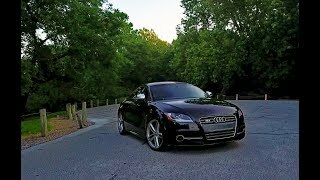 In all exterior of Audi TTS Coupe 2015 is attractive, innovative and aggressive. Audi TTS Coupe 2015 gets its power through a 2.0 Liter TFSI engine which delivers total output of 308 hp and peak torque of 380 nm paired to six-speed S tronic transmission. 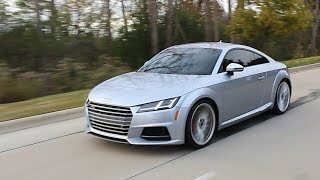 With its power through the engine Audi TTS Coupe is capable of reaching a top speed of 155 mph, which is an electronically limited figure while the 0-62 mph sprint gets covered in just 4.7 seconds.